Are you interested in putting a team together for the Polar Plunge “Escape from Sing Sing” on Saturday, February 17th at Louis Engel Park Beach Area? To register as an individual or team please email gullottahouse@gmail.com. 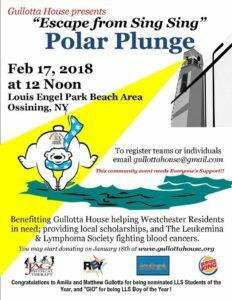 Your participation will benefit Chamber member Gullotta House who helps Westchester Residents in need; providing local scholarships, and The Leukemia & Lymphoma Society fighting blood cancers.